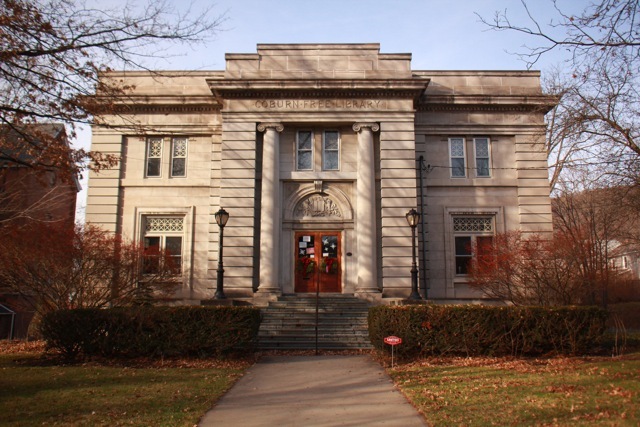 Coburn Free Library hosts regular events and organizes special programs all year round. Below is an overview of current and upcoming events. Please see our Events calendar for upcoming programs. AARP Tax Help: Between February 1 and April 15, we host AARP tax volunteers to help you prepare your tax returns. You don’t have to be a senior citizen to take advantage of the free help, but you DO need to make a reservation; volunteer tax preparers only come in on Tuesday evenings, and can only see four people per night. To reserve your spot, call the library at (607) 687-3520 after January 15. And if you need paper forms to prepare your taxes yourself, a limited selection is available at the library. Fiber Arts: Every Thursday evening at 6:30, crocheters, knitters, and practitioners of any fiber art meet in one of our upstairs meeting rooms. You’re a total beginner? Don’t worry; the group will teach you everything you need to get started! Friends of the Library: Visit our Book Sales held by the Friends of the Coburn Free Library in March, June, and November. They also have a “Books by the Box” sale in August. Watch our calendar here and on Facebook for exact dates. Our Friends of the CFL is a spectacular group which greatly benefits and supports our historic library. If you would like to join the Friends, please email director@coburnfreelibrary.org for more information. Monday Afternoon Book Club: This small, intimate group meets at 1 PM on the second Monday of the month for a lively book discussion. No specific topic or genre, but you’ll never be bored! Watch our Facebook page for next month’s title! Mystery Book Club: Every month, members choose a novel they want to read, the library uses interlibrary loan to borrow enough copies for everyone, and then members meet on the first Thursday of the month to discuss the featured selection. We’ll post next month’s title on our Facebook page. PAWS to Read: Every month, our PAWS for Friendship service dog Turbo visits the library for PAWS to Read. This program allows children to read aloud to a therapy dog. This promotes enthusiasm and confidence while simultaneously improving communication and reading skills. Registration and a permission slip is required for this program. Watch our calendar for exact dates. Story Hour: Every Wednesday at 10:15 AM we share our favorite picture books with children ages birth to 5 and their parents or caregivers. Your child doesn’t sit still? That’s okay; we’ll have fun anyway! Don’t be surprised to learn a few finger plays and active nursery rhymes. It’s summer time and older children are out of school? Bring them along too. We host special story times in July for Summer Reading but in June and August we welcome older kids too! Our story times are built around books and engaging readings but also include movement, song, crafts, and play. I’d say that’s great for all ages. Summer Reading Programs: In July our story hour program changes a bit since older kids are out of school. That month we co-sponsor Summer Reading Programs with the Town of Owego at the Methodist Church next door. Your whole family will be entertained by the best children’s performers, whether they be storytellers, musicians, magicians, or authors. Best of all, the programs are free and no registration is required. As soon as school’s out, check in at the library to pick up a reading log; kids who keep track of the books they read over the summer can win prizes!